Warm up exercise is essential before getting down and doing your actual workout. Why, you ask? Well, the reasons are plenty, and the most important ones are like improving the circulation of oxygen and blood flow to your muscles, improving your body's agility, reducing risk of injury, getting better body reaction time, helping you perform your workouts better, etc. See? Of course, there are many more reasons that work to your advantage, and you can easily google them. Today, however, we’re only going to focus on the best warmups for you. The exercises mentioned below are suitable for most age groups, as well as for people with varying body flexibilities. Choose the one that are most convenient for you. Well, duh! Mild jumping for a mere 5 minutes can easily get the job done for you. It quickly increases your body temperature and heart rate, which in turn makes it easier for your body to burn fat. If 5 minutes seems too much for you, then begin with 2 minutes, and slowly work your way up from there. Going up, holding that pose for 3-5 seconds, coming down, and then repeating the process. 10 reps are more than enough. You can get creative and experiment with the difficulty levels once you get comfortable with this exercise. These warm up exercises are very popular among fitness enthusiasts, and for good reason. Not only do they immediately make your muscles work, but they also help in toning your lower body. And if that isn’t enough, they also work on the core muscles of your chest and abdomen. The image is self-explanatory. Just ensure you don’t bend too far ahead. Take the help of an instructor if you’re new to squats. Ankles are often the most ignored part of the body, and it’s important to stretch them too. Apart from your ankle, this warm up exercise also works on your back, arms, hamstrings and lower back. Begin by positioning your body on your fours. Then, alternate between putting your left foot over your right ankle and vice versa. Begin with 20 reps and work your way up when you feel you can pull 20 reps easily. The picture is self-explanatory. All you have to take care of is your breathing. Breathe in slowly and deeply with your nose. Then slowly, breathe out with your nose till you’ve breathed out all the air in your lungs. Repeat this process at least 15 times. During this entire time, make sure you don’t breathe through your mouth. This stretches your inner thigh, abdominal and groin muscles. Just sit, stretch out your legs as much as you can, and then push forward with both your hands ahead. Try to go as far as possible, and if you can, try to touch the mat with your forehead. 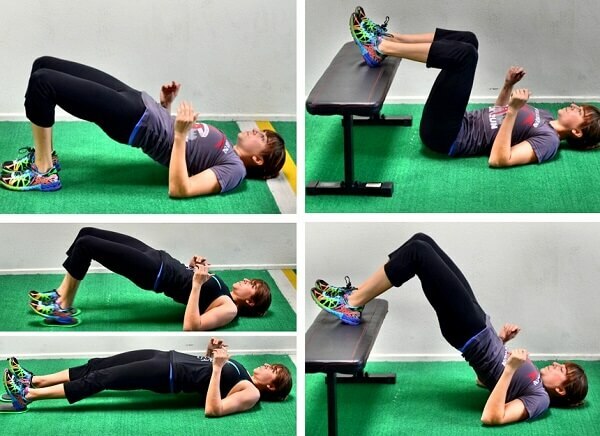 This will put added pressure on your abdominal muscles. Sure, you can do pushups if you can, but if you’re new to warm up exercises, then begin with half pushups. The only difference between pushups and half pushups is that in the latter, you place your knee on the mat to form a support for your body or more specifically, your back. Exhale while pushing up, and inhale while going down. This is a variation of the classic lunge. While the latter works on mostly your leg muscles, the knee lift lunge also works on your abdominal muscles as well. Apart from that, it tightens your core, and improves your body posture and balance. When doing these lunges, make sure you try to make knees go up to the level of your chest. The more you raise your knees, the more calories you’ll burn. One lunge on both legs = 1 rep.
Make sure you do a minimum of 15 reps i.e. 15 times for each leg. This exercise looks like a knee lift lunge, but it really isn’t. This warm up exercise should best be done before intense workouts, because it very quickly increases your heart rate and body temperature. Stand up straight, and then start raising your knees one after the other in quick succession. Make sure you’re jumping or skipping while doing so – your entire body should move. Bring your knees to the level of your abdomen, and make sure they’re always perpendicular to your abdomen. Do so for 1-2 minutes. This is one of the best warm up exercises for your back. When you are on your fours, put your right hand on the nape of your neck. Bring your right elbow down, trying to touch your other arm. Of course you can’t really touch it, but that is the movement you should do. Then bring it outwards and imagine touching the ceiling with your elbow. Repeat this with your left arm. Do at least 10 reps each. When you put your hand behind your neck, make sure your upper arm is straight and not tilting sideways. Then touch the elbow with your other hand and apply pressure in a downward direction. Do so for 2-3 seconds and then repeat with your other hand. Stretching both hands = 1 rep, so make sure you do a minimum of 10 reps to warm up your triceps. Is Good Morning Exercise Safe? How to Get Back in Shape? Why Do I Weigh Less in the Morning? Is Jumping Rope Good for Abs? Why Your Heart Rate Increases When You Exercise?